It seems right now that popups are everywhere – popup shops, restaurants, and more. A popup is basically a temporary location for the company or idea to setup shop that might be because the owner doesn’t want to manage a consistent location, wants to try out a new location, or just wants to test a business concept. I like the idea of popups because I get to try new food/drinks or shop for items I might not otherwise have found. 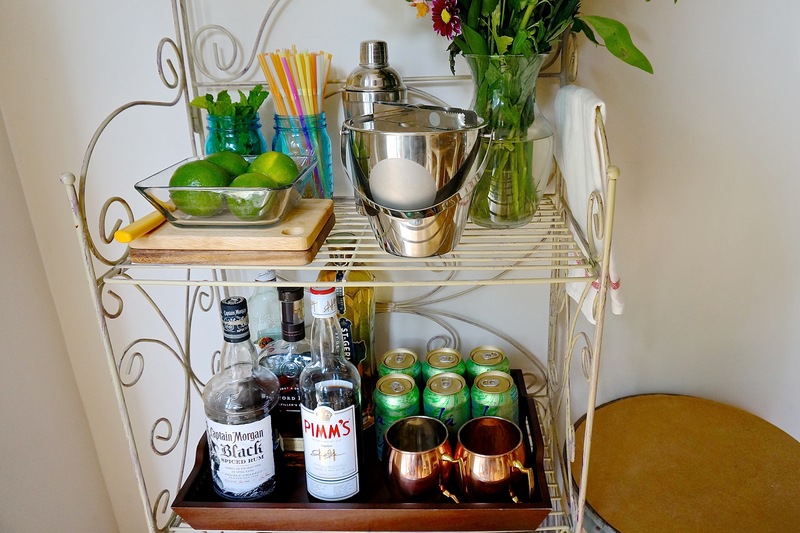 So why not take that idea and make a “summertime drink popup bar”! My popup bar will be for a few types of similar drinks. In the summertime, I tend to gravitate towards summery drinks, like a Pimm’s Cup, Moscow (or Bourbon) Mule, Dark and Stormy, or Mojito! 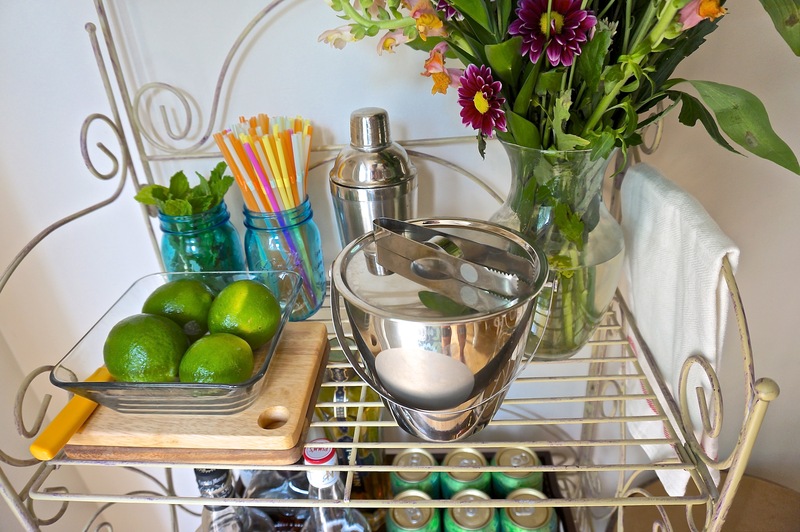 Hmm, I see a theme – these all have mint and/or lime, ice, some alcohol and a mixer. My popup bar will be in place as long as I like it or maybe through the summer, who knows! You could also just set it up for a specific party or some other drink theme you like – how about July 4 or Cinco de Mayo! Now what will I use for the actual bar? 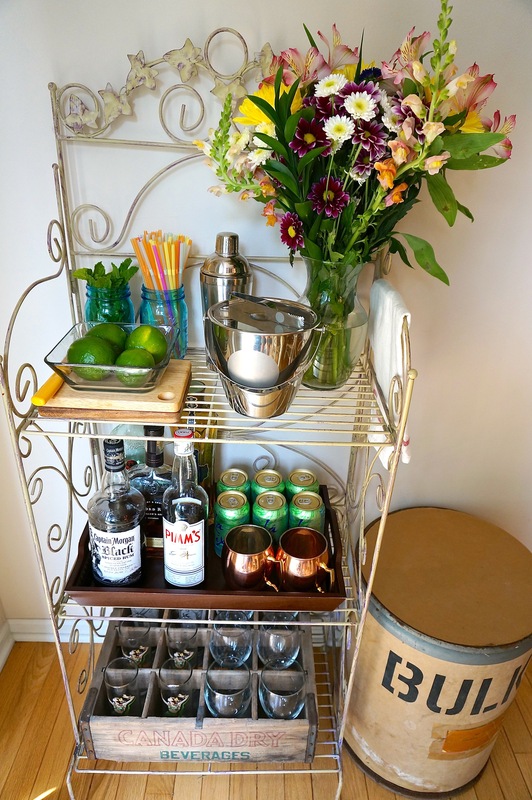 I love the idea of finding an old tea cart or library/rolling cart. I have seen several at markets this summer from vendors like City Salvage, ampersandcle, and the Gallery Tremont. Or how about using an old chest or nightstand you might find at a thrift store. I have a metal baker’s rack that I’ve used for plants and other collections. I think that will be a fine stand for my popup bar. Ok, it’s time to stock it! 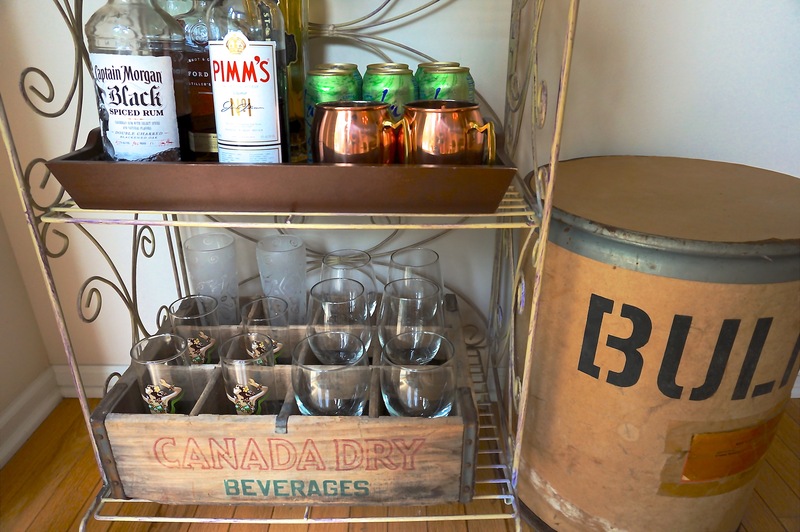 I’ve outfitted my bar with glassware for the drinks I am focused on. 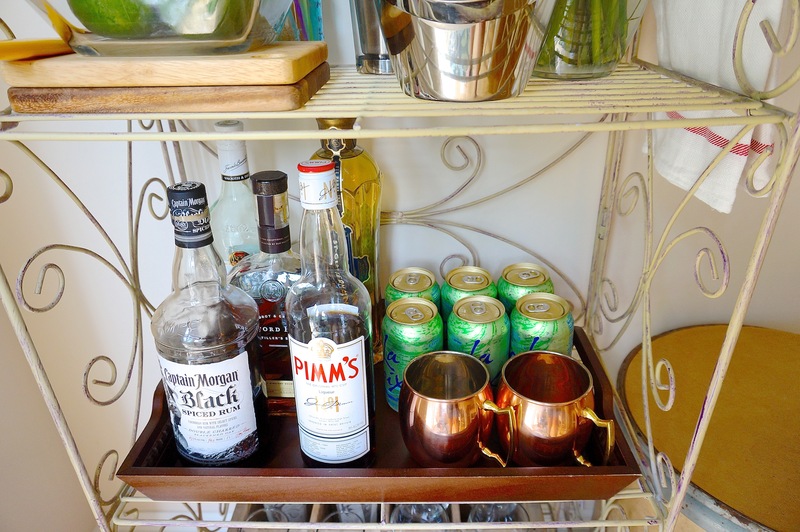 Moscow Mule is served in copper mugs (love these!). Mojitos and Dark ‘n Stormy I like to serve in a tall pilsner or highball glass. I pulled a few from our Leandra Drum collection and a few Hawaiian girl glasses. For Pimm’s I use a stemmed water or wine glass. I found the great Canada Dry box at Metheny Weir. It’s the perfect place to store the glassware! For my drink choices I need white rum, black rum, Pimm’s, vodka, St Germaine and bourbon. You could certainly do a non-alcoholic popup bar as well. How about a lemonade bar with different types of lemonades or flavor syrups to mix in? How about a coffee bar with different coffees, syrups, cinnamon/chocolate to add? I use La Croix in Mojitos, Gosling’s Ginger Beer in Moscow/Bourbon/Dark’n Stormy and 7Up in Pimm’s. Add a few of these to your bar and re-stock as needed. I just love this word! …ok, I could have just said garnish 🙂 I can set out limes and ideally a mint plant for the summer (if it’s just for the day, sprigs of mint will be fine). My mint plant is currently on my deck growing like crazy! I also set out fresh ice and other fresh fruit from the fridge as needed or right before a party. For a lemonade or iced tea bar, you could add fresh fruit – peaches, raspberries, strawberries as well as herbs like mint or basil! And finally, we just need a knife (to chop garnish), an ice bucket, and a cocktail shaker. Let the mixing and sipping begin.